Australia Day weekend saw crowds flock to the foreshore to enjoy the spectacular weather. 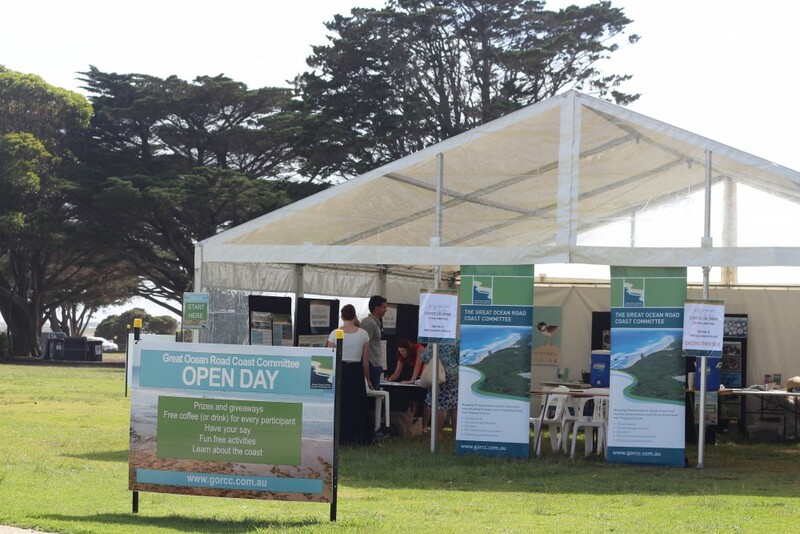 The GORCC Open Day was held on the Saturday of the three day holiday, with a marquee set up on the Elephant Walk Reserve in Torquay. The successful event attracted approximately 160 locals and visitors who came along to have their say, learn about GORCC’s work and projects, enjoy the giveaways and prizes on offer or particpate in the fun, free environmental activities. Not surprisingly the activity stall was the stand out favourite of the day providing entertainment and education to kids of all ages who made their own ‘insect hotels’, created their own Hooded Plover badges and more. While the kids were busy creating their masterpieces, mums, dads and grandparents asked questions about the coast and had their say on GORCC projects. The GORCC’s Draft Coastal User Transport Strategy was on display as was information about coastal hazards and coastal safety. The day also included promotion of GORCC’s Save the Hoodie Campaign. A sign featuring ‘Hamish the Hoodie’ was on display, giving people a chance to enter the #SavetheHoodie campaign and go into the draw for $1000 in prizes. More information can be found at www.savethehoodie.com.au and the competition closes on 1st April 2015. A $1000 Quicksilver voucher is also up for grabs as part of this year’s Coast Survey. Did you visit the GORCC Australia Day weekend stall? What did you think? Share your thoughts below! World Environmental Day, Every Day! Did you know it was World Environmental Day (WED) yesterday? WED is all about encouraging involvement from the local community and celebrating the wonderful work of individuals. We’re so lucky to live in such a beautiful area and sometimes we forget to stop and thank the people that help make this possible. The wonderful work our local environmental groups do for our community doesn’t go unnoticed and we would like to personally thank each and every individual who has made a positive contribution within our region. Who says volunteering has an age limit? 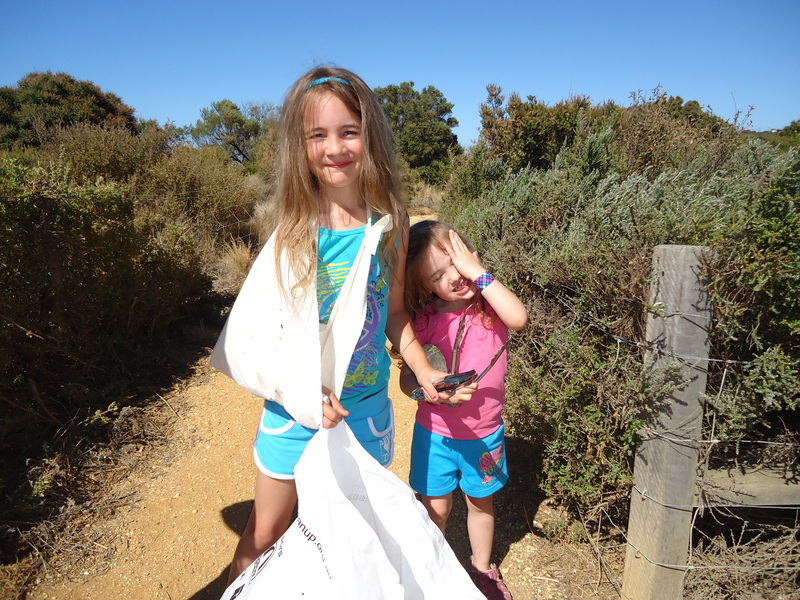 These two little helpers did their bit in keeping Australia beautiful during last years Clean Up Australia Day. Why wait for a special day to show your appreciation? Anyone can make small gestures of gratitude every single day of the year. Do you know someone who works hard in the area, not expecting anything back for it? Why not tap them on the shoulder today and let them know what a great job they’re doing? It doesn’t cost anything and they are sure to appreciate it… Whether they admit it or not! For a list of some local groups making waves in the community, or to find out if volunteering is for you, click here. Keen to get involved but not sure where to go from here? Find all the answers you are looking for through the GORCC website or click here to check out our insightful video. Seven organisations have worked together to bring environmental education alive for 170 local students as part of National Water Week and in celebration of 20 years of Waterwatch. Gemma McNaughton and Charli Bechmann from Anglesea Primary School. The ‘Creek Connections’ event, which was hosted by the Corangamite Catchment Management Authority (CCMA) at Spring Creek, saw the students learn about local water catchments. The day involved volunteers and staff from Waterwatch, The Marine and Freshwater Discovery Centre, the Wathaurung Aboriginal Corporation, The Great Ocean Road Coast Committee (GORCC), Estuarywatch and EcoLogic. 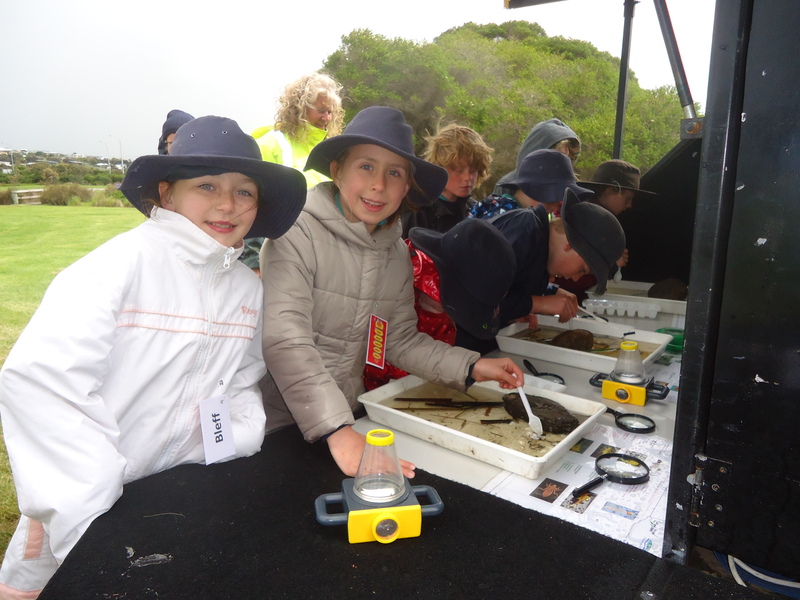 Grade 3 and 4 students from St Therese Primary School, Torquay P-6 College, Lorne Aireys P-12 College and Anglesea Primary School enjoyed everything from ‘water bugs’ sessions and ‘estuary discoveries’ through to a ‘walk and talk’ with Wathaurung Elder Bryon Powell. 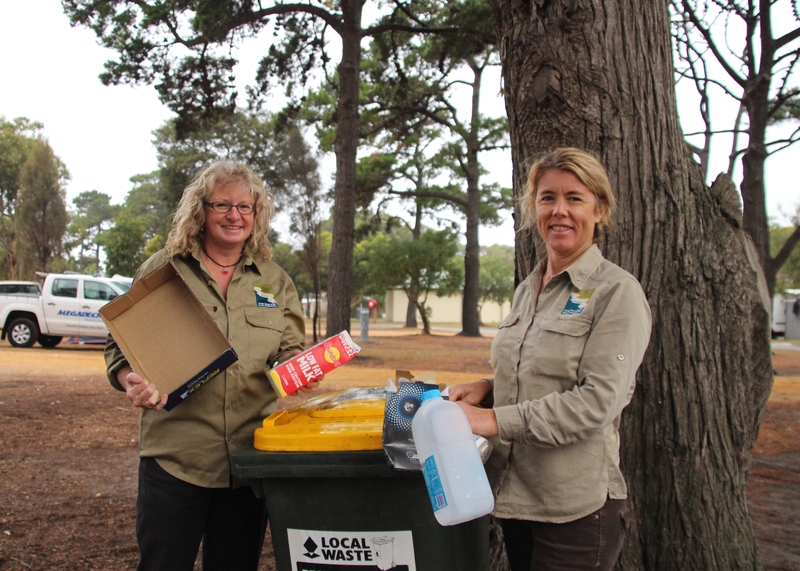 GORCC Conservation Officer, Georgina Beale who helped to host a ‘recycle relay’ and conduct planting sessions in threatened Moonah Woodlands said students learnt about keeping water catchments healthy. “The kids learnt about the interconnectedness of our catchments, rivers, estuary and marine environments and the protection and conservation of our river systems and their dependent eco systems,” she said. Students worked tirelessly to create water bug costumes out of recycled items for the ‘Terrific Transformer bugs Creative Costume Challenge’ in the lead up to the event. Winners of the best costume prize received special computer microscopes which will allow their whole class to view water bugs up close on a large screen. Waterwatch Facilitator, Cate Barham said the diverse range of activities aimed to encourage students to develop an appreciation and understanding of marine, estuarine and freshwater environments and Wathaurung culture. “Everything we do in our catchment can have an impact on our waterways. If you drop a piece of litter, it will eventually find its way to a waterway and then out to the ocean, where it can have devastating effects on our marine life,” she said. Waterwatch Victoria recognises that only 22% of Victoria’s rivers are considered in good or excellent condition, highlighting the need for action to protect and maintain the health of our local water catchments. Ms Barham encourages other community members to become active in protecting and caring for their local water catchments by joining a Landcare, Coastcare or Friends group in their area. “We are all responsible for caring for our catchments and hopefully others will feel inspired by the enthusiastic efforts of our Creek Connections ambassadors,” she said. The second Bell Street Fiesta is set to explode with a fun filled day of events, activities, stalls and entertainment for all ages as part of the Drink Art Food Torquay (DAFT) Weekend. 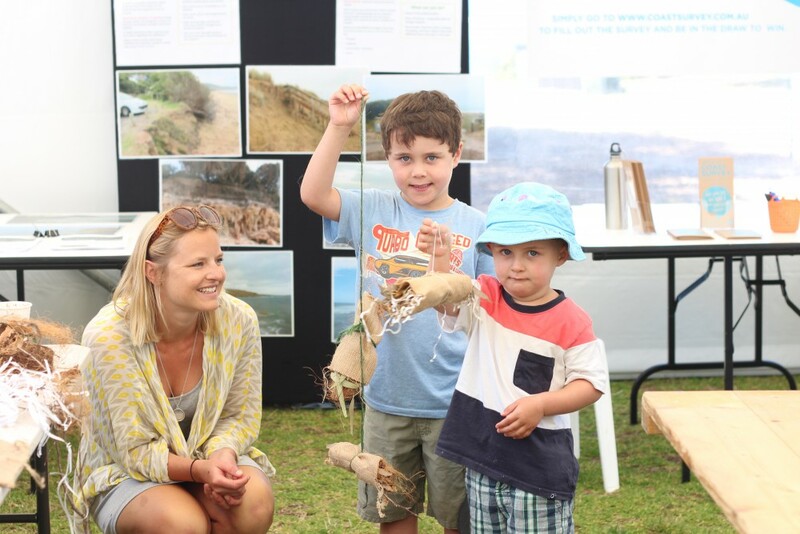 The Great Ocean Road Committee (GORCC) is hosting an interactive, environmental education stall at on the day. Eco-Logic Education and Environmental Services have been comissioned by GORCC to set up the stand which will featuure a range of fun activities for all ages. Activities include quizzes, ‘Spot the Hoodie games’, story book reading and plasticine fun. All the fun will take place in Bell Street Torquay, commencing at 11am. Click Here to check out the weekend program filled with events, activities and entertainment for all ages. Biodiversity month – get involved! September is Biodiversity Month and there’s heaps of simple ways that you can get involved. Biodiversity month is held to promote the importance of protecting, conserving and improving biodiversity both within Australia and across the world. Create a natural habitat in your backyard. Learn more about going indigenous in your garden! Get rid of weeds: Do you know which innocent looking plants are actually environmental menaces? Be a responsible pet owner – Keep your cat indoors at night and keep your dog on a lead! Start your own compost bin. Be an informed seafood eater: Learn more about choosing sustainable seafood. There’s plenty of other simple ways to help to protect our coast’s biodiversity, for more click here. Biodiversity is the ‘web of life’, ‘the variety of living things’ or ‘the different plants, animals and micro-organisms, their genes and ecosystems of which they are a part’. Australia is very unique and is home to between 600,000 and 700,000 species, many of which are found nowhere else in the world. About 84 per cent of our plants, 83 per cent of our mammals, and 45 per cent of our birds are only found in Australia. Take a peek at some examples of our coast’s fascinating wildlife. You can find more about Biodiversity Month here. How are you working to protect and preserve our coast?? A pretty perennial which features in many private gardens is invading coastal environments and proving that looks can be deceiving. 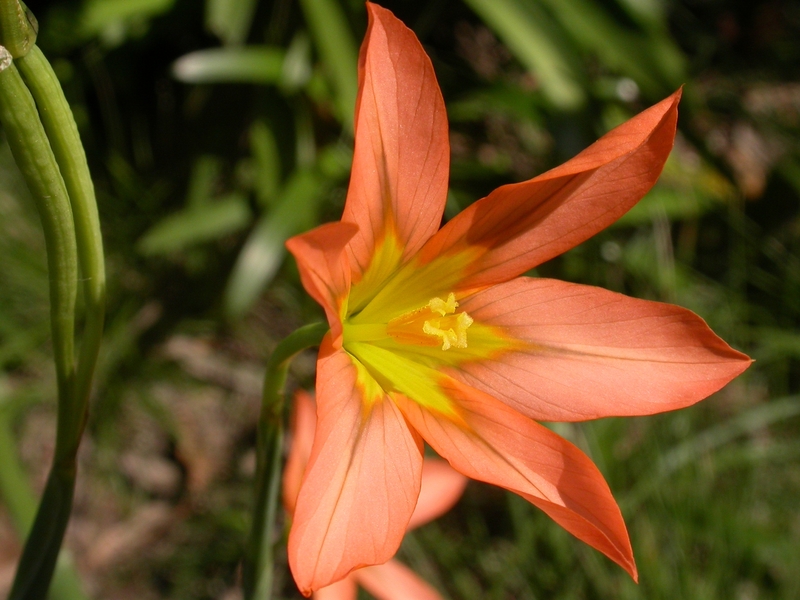 The Cape Tulip (Moraea flaccida) is a popular garden plant that features salmon pink or orange flowers and is available for purchase at a wide range of garden centres and nurseries. The Cape Tulip may look innocent, but it is actually a noxious weed. It’s therefore not surprising that many coastal residents don’t realise they are harbouring a noxious weed on their property. Great Ocean Road Coast Committee (GORCC) Conservation Office Georgie Beale said the Cape Tulip, which grows from a bulb, is a particular problem in the Aireys Inlet area. “The Cape Tulip spreads by a number of methods including via wind and running water and the movement of soil. “The corms (underground plant stems) and seeds can also be carried by the wool or fur and feet of animals or through green waste disposal,” she said. 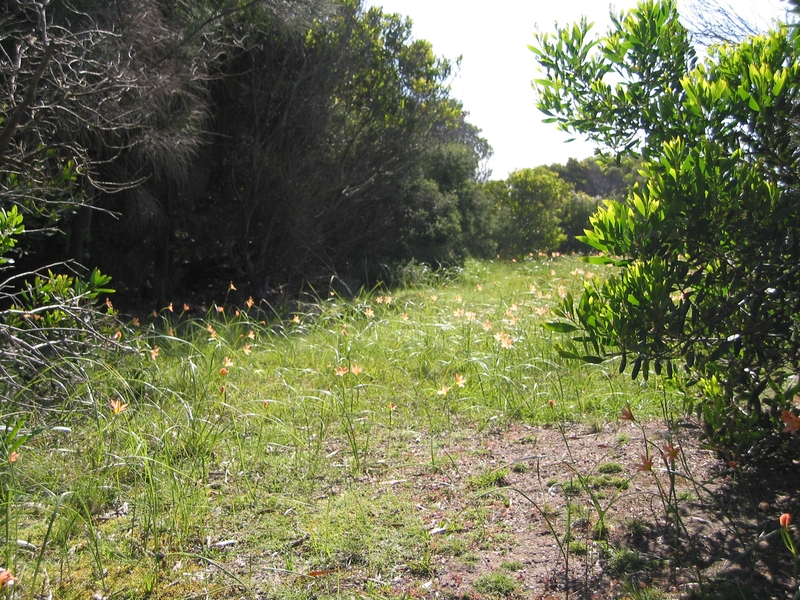 An example of typical Cape Tulip habitat and spread. Ms. Beale said that GORCC’s Environment and Land Management Plan found that the most significant issue facing the natural environment along the coast is the impact of weeds. “We have been working with local volunteer groups ANGAIR and Friends of Aireys Inlet Coastal Reserve to control the spread of weeds like Cape Tulip for years through spraying and other methods,” she said. Attempts to manage the weed have been successful however work is hampered by the persistent spread from private and other property. “Attempting to control the problem in isolation is not an effective strategy so we work with partnering bodies as part of the Otway Eden Project such as the Department of Environment and Primary Industries. “We have also approached and discussed the problem with adjacent landholders in the area,” said Ms. Beale. The Cape Tulip spreads easily and can be carried by wind, water, soil or animals. 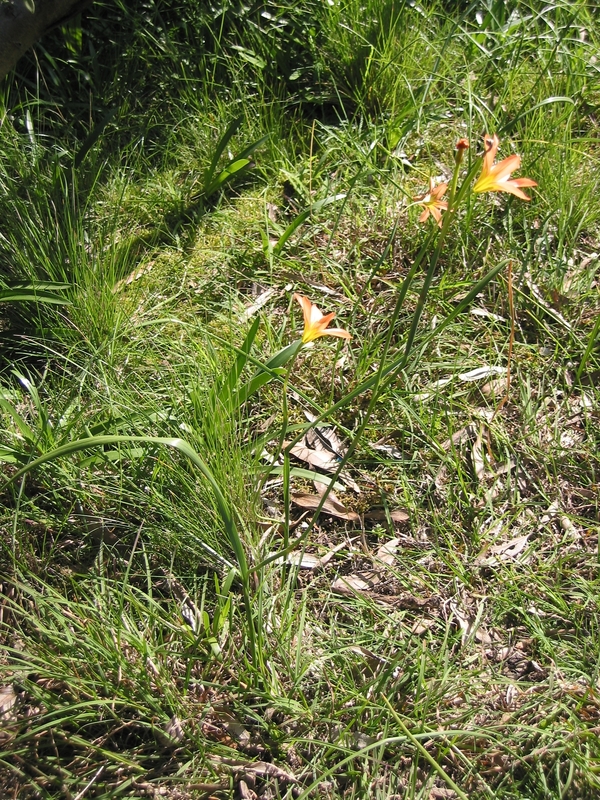 Ms. Beale encouraged landholders on the coast to identify the Cape Tulip and remove it from their garden. “Small, isolated pockets can be dug up and disposed of, however large areas may need spraying,” she said. For more information on weeds on the coast download Environmental Weeds Invaders of the Surf Coast Shire online or visit www.gorcc.com.au. This article appeared in the Surf Coast Times Green the Coast Column. Have you spotted Cape Tulip in your garden or on the coast? ?